Evidently the stuff on the left hand side, that’s my job. If I don’t want to fear, I need to 1) TRUST GOD, 2) DON’T LEAN on my own capacities, and 3) ACKNOWLEDGE GOD in all things. 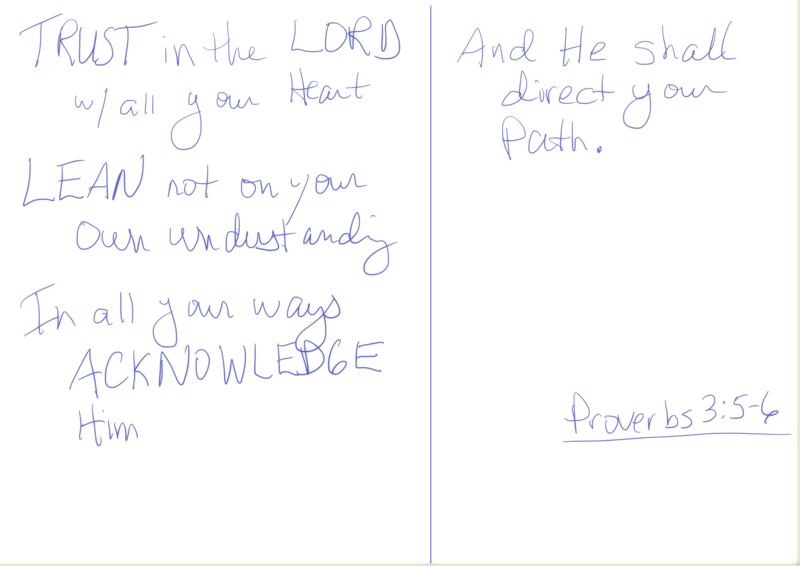 If I do these three things, according to Proverbs 3:5-6, God will direct my path. What a humbling concept. The line brought a much deeper understanding, even practical application, to a passage I’ve read hundreds of times. You see, I trust God, at least I think I do. I acknowledge God in every chance I get. But as a confessed closet control freak, “Lean not on your own understanding” is a slap in the face. My understanding doesn’t scratch the surface of God’s. Why should I try to control a situation when He is by far better equipped to handle the situation? Yet strangely I seem to think I know better than He does when I do things in my own power instead of being dependent upon Him. So, God, I hear you. Use me. Humble me. Break me. Life’s far more rewarding when we’re leaning on His understanding than our own. I do not know where this path goes, but I know the one who owns it. In Him will I trust.